Sonic Air System's centrifugal blowers are used for Landfill Gas & Brownfield Soil Vapor Control. LFG is landfill gas produced primarily by the decomposition of solid waste buried under ground. The primary components of LFG are methane, CO2 and H2S (where the rotten egg smell comes from) but it can vary depending on the age of the landfill and the assorted chemicals that may have been disposed there. BROWNFIELD soil vapours occur where there is a site which has been contaminated by solvents, hydrocarbons and other chemicals which were either disposed of into the ground (decades before anyone realized the consequences) or more commonly from leaking underground storage tanks. There are also some small unregulated/unlicensed landfills, which may be classified as brownfield instead of landfill. Most contaminated soil sites in the U.S. were put on a list of SUPERFUND sites by the EPA in the 80’s & 90’s. Any contaminated ground which was not in a contained condition, meaning that it was in contact with (or having the potential thereof) groundwater, was required to be excavated with all of the contaminated soil either decontaminated (by incineration or chemical neutralization) and put back into the ground or removed and disposed of where it wasn’t near any groundwater. Some toxins were so bad that, even if there was no groundwater concerns, they too had to be excavated due to the hazards they pose. When excavation is not required, the most economical method of controlling the flammable or noxious vapours from a landfill or brownfield is with a well system consisting of many perforated PVC pipes going vertically down through the vapour producing materials and placed around the vapour producing boundary which is then connected together using a larger header pipe running to a blower system. The well system can be designed for either gas/vapour extraction or fresh air injection into the ground. When the hydrocarbon concentrations are high enough to burn, or the toxicity and/or odor of the vapours are an issue, vacuum blowers connected to the well header pulls the vapours laterally under the ground to the extraction wells. This method, with the right quantity and location of wells, can reduce surface release of the vapours by 90+% versus with no vacuum blower. For landfills the higher methane content LFG can be filtered and dewatered in order to pump into engine driven generators. In the case of brownfields, or landfills when the BTU rating of the gas is too low to run a generator, the vapours must be extracted with a blower for either incineration in a flare system or put through a chemical scrubber to remove harmful or nuisance odours prior to release into the air. In Brownfield gas control, this vacuum process is the same but is then classified as soil vapour extraction (SVE). For those landfill or brownfield conditions where the vapours have a very low hydrocarbon content and the vapours have little or no noticeable odor, the concept of fresh air injection into the perforated wells has proven to be effective and the lowest cost option of all. This fresh air injection method is used when the brownfield gas has trace amounts of hydrocarbons (very low BTU rating) and/or has no toxicity in the vapours which are allowed to escape into the atmosphere. The air barrier prevents gas from traveling laterally under the ground which could then accumulate under any structure or slab adjacent to the contaminated soil site. This gas build up could be prone to ignition if allowed to continue, so the air barrier is primarily a fire/explosion prevention system. .
1) LFG is always at a constant temperature of 75-80F regardless of ambient temps from 0 to 110F. Every other aspect of LFG adds to the difficulty of pumping it through a blower. However, Sonic is mechanically better suited for handling LFG than most other blower manufacturers. 2) Most LFG has a lot of liquid in the gas stream from the water in the landfill or condensate from cold outside temperatures. The volume of liquid depends on the well system, the amount of rain fall, the slope of header piping and the capacity of liquid knockout vessels. Piping must be sloped upward towards the blower inlet from the knockout to prevent random slugs of liquid from being sucked into the blower. Sonic blowers can handle a saturated vapour stream, but no liquid entrained in the gas stream. 3) There can be a wide range of particulate matter, which varies throughout the 30-50 LFG life span of a closed landfill, and the corrosive as well as "coating" effect on the blower can change over time. What is not a problem today can be a new problem tomorrow. Sonic does not have any filters which we could recommend for such LFG use. The most common method is to put a flame arrester before the blower which serves both as a backfire device and a filter (very fine mesh inside) for the blower. 4) The amount of H2S (hydrogen sulphide) in most LFG gas streams is usually less than 1%, so Sonic blowers with a hard anodized aluminium housing and impeller protects the blower for most applications. The problem with LFG and SVE Sonic blowers is they can never be sent to the Sonic factory for service as the odors and/or the unknown gas compounds require the customer to perform their own service. Therefore Sonic cannot perform any factory repairs on a landfill or SVE service blower, but we have all the service parts in stock. 5) The vacuum requirements at the well heads are usually not more than 40-50"H20 + piping losses to the blower and the pressure range can be 15-80"H20 depending on if the gas is flared or being pumped into an engine for co-generation. 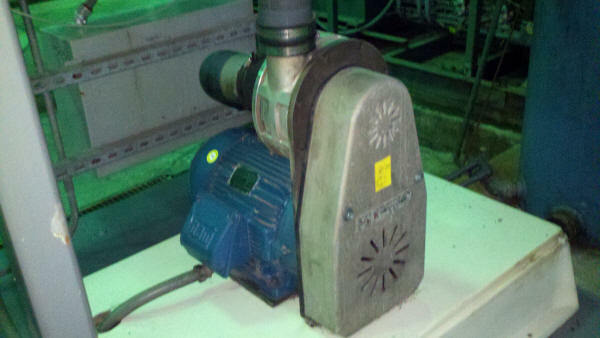 Some LFG blowers are 5Hp and 200 CFM with 50” H20 and large municipal landfills require 100 HP blowers with 5000 CFM. 6) The pressure blowers for injection usually do not exceed 20Hp and pressures of no more than 3 psi.